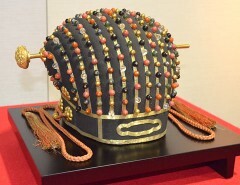 The Royal Crown which was used for important ceremonies during the Ryukyu Kingdom era. The Royal Crown was used for important ceremonies during the Ryukyu Kingdom era. It has 288 ornaments made of gold, silver, crystal, coral, and seven others. Two dragons that symbolize the Contact the Naha City Museum of History at 098 (869) 5266 for more detail.